Yum! 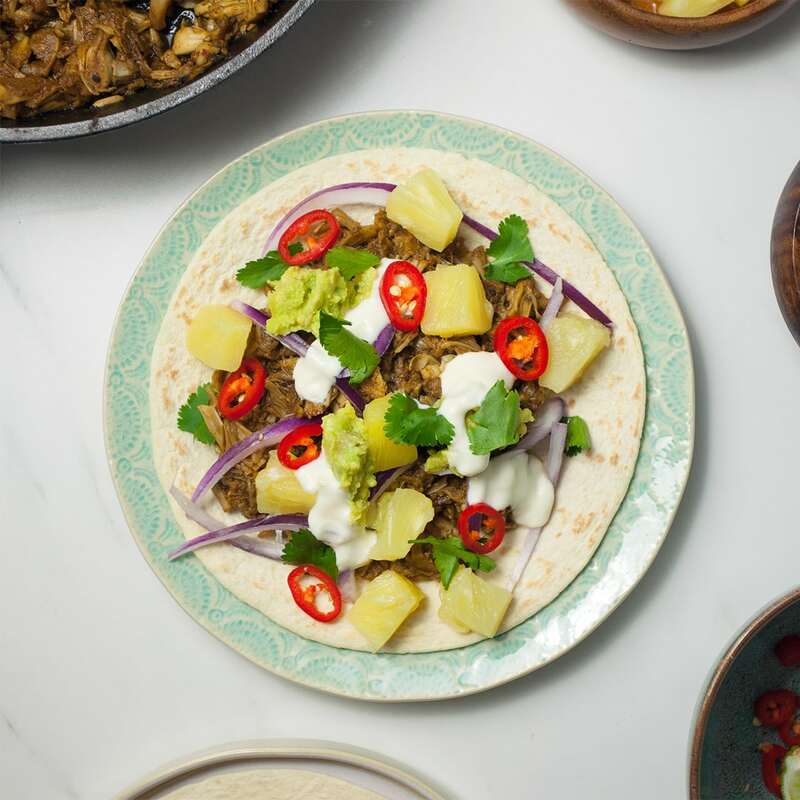 This jerk jackfruit tacos recipe is bursting with sweet and spicy flavours, and it’s really simple to make. It’s pretty much a one-pan recipe. We’ve tried to cut out as many unnecessary steps as possible so it should only take about 20 minutes from start to finish. If you already have a go-to recipe for jerk seasoning, then you can easily substitute it in this recipe. If not, you can find dry jerk seasoning in most supermarkets. We always try to buy seasonal produce when possible. In the warmer months, we’ll use fresh pineapple or mango, otherwise we’ll go for tinned pineapple. Put a little coconut oil in a frying pan on a medium - high heat. Once hot, add the jerk seasoning and minced garlic and fry for 1 minute, stirring frequently. Drain and rinse the jackfruit. Then transfer to the frying pan with the vegetable stock, maple syrup, soya sauce and ketchup. Stir to combine and leave to simmer for 15 minutes. Meanwhile, prepare the toppings by slicing the red onion thinly, opening the can of pineapple or dicing a fresh pineapple, mashing the avocado, and finely slicing the red chilli. Remove the frying pan from the heat and use a potato masher to mash the jackfruit so it becomes juicy and stringy. Place a clean frying pan on a high heat and toast the tortilla for a minute or 2 on each side. Then transfer to a serving plate. 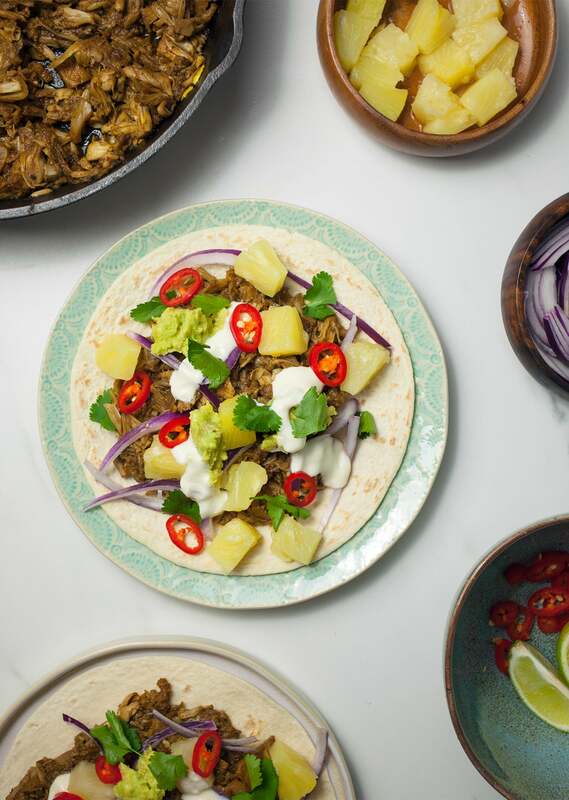 Build the tacos by spreading a couple of tablespoons of jackfruit in the middle of the tortilla, then sprinkle some slices of red onion, cubes of pineapple, a few spoonfuls of mashed avocado and a drizzle of yoghurt. Finish with a sprinkling of sliced red chilli, coriander leaves and a drizzle of lime juice. I was reading more on jackfruit and it is not a protein source, so I was wondering why people used it as a pork substitute because it made meals be overloaded with carbohydrates. Not sure if I am mistaken, but if my suspicion is correct, how can we make this meal more balanced?